Tibet with Mount Everest Base Camp Tour is a very comprehensive tour of Tibet with visits to the cultural, historic and natural attractions of Tibet. The tour includes all the important places of interest in central & south Tibet including a visit to Rongbuk Monastery and Mt. 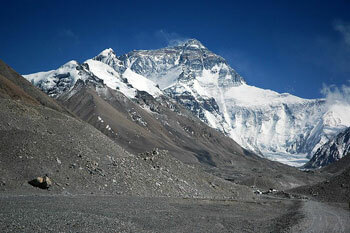 Everest Base Camp.We drive from kathmandu to Zhangmu Rongbuk than walk to Everest Base camp . After Excursion to Everest Base camp we drive to Lhasa via Gyanste & Shigatse. After ending trip to we fly from Lhasa to Kathmandu, Chengdu or Beijing, explore the cultural and historic sites of Lhasa, Everest Base camp,Shigatse and Gyantse is the main focus of this trip. Day 05: Xigatse- Gyantse (3950m) 90km. After Breakfast drive to rongbuk..
A 2 Hrs. Trek from the Rongbuk Monastery Will Lead You the Base of the Highest Peak on Earth - The North Face or Mount Everest (8848m) or Mount Quomolangma in Tibetan. Explore the Base Camp and The Later In the Afternoon to Tingri (Approx 98 Kms) O/N at Guest House. Depending upon the road conditions, Shakya Monastery, which is 26 km. Off from the main road will be visited. Shakya is one of he oldest and most important monastery. Reach Xigatse, the place of the famous Tashilumpo Monastry the seat of Panchen Lama his death in 1989 with its huge thanka Wall cleary visible on north side of the road. Overnight . 08-hr drive takes you to Lhasa crossing the Karola Pass (4794m). The Karola climbs between two lofty mountains, Nozing Khangsa (7223m) and Ralung (6236m) while driving you will see the Yamdrok Tso (Turquoise Lake) which takes approx. 1 hour to cross around. After passing Kampala, Lhasa Valley is seen to the north. You will also cross the Brahmaputra River. Reaching Lhasa and check in hotel. The accompanied guide will reconfirm your onward airline ticket. Overnight l.
Transfer to airport 02hr.drive. Representative will assist you. Departure of flight your onward destination.